We’d love your help. Let us know what’s wrong with this preview of Un gioco da assassini by James Quinn. Nell’oscuro mondo delle operazioni segrete, un gruppo di assassini misteriosi sta scatenando il caos tra le fila del MI-6. Siamo al culmine della guerra fredda e degli agenti dei servizi segreti britannici vengono presi di mira da un ignoto gruppo di sicari. In preda alla disperazione, l’agenzia manda il suo miglior agente a dara la caccia a questi assassini. Jack “Gorilla” Nell’oscuro mondo delle operazioni segrete, un gruppo di assassini misteriosi sta scatenando il caos tra le fila del MI-6. Jack “Gorilla” Grant non è uno dei tipici agenti segreti. Inflessibile e spigoloso, non va d’accordo con glia genti elitisti e affascinanti dell’intelligence. Jack viene trascinato in un gioco in cui niente è come sembra, e persino la spia perfetta può morire in un deserto di specchi. Riuscirà a scovare gli inafferrabili assassini prima che sia troppo tardi? Una storia di spionaggio che devi leggere. 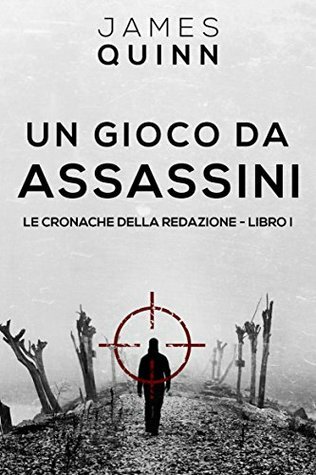 “Un gioco da assassini” è un thriller ricco d’azione ambientato nella scena globale della guerra fredda. To ask other readers questions about Un gioco da assassini, please sign up. Excellent book for a first time writer! It's like Jason Bourne, James Bond and Peter Devereaux aka The November Man all in one. Once I got started reading I couldn't put the book down! Good plot. Good story line. Good characters! A modern post World War II spy espionage novel with a good ending that's doesn't leave you hanging! Classic spy/espionage novel with assassinations....5+Stars! I don't get to read a lot of spy thrillers these days, but this genre is always really exciting to me - certainly some of my favorite movies are from this genre. The fact that this book also is set in the Cold War and fits into the historical fiction category makes it that much more interesting to me. This book is gripping and intense from the beginning, and it keeps up the action and intrigue all the way through. It's a very long book - packed with detail, twists, characters, settings, and acti I don't get to read a lot of spy thrillers these days, but this genre is always really exciting to me - certainly some of my favorite movies are from this genre. The fact that this book also is set in the Cold War and fits into the historical fiction category makes it that much more interesting to me. This book is gripping and intense from the beginning, and it keeps up the action and intrigue all the way through. It's a very long book - packed with detail, twists, characters, settings, and action - but I never consider that a bad thing. The writer is a knowledgeable authority on the subject matter, and at several points the story feels like real-life tidbits are thrown in, giving the whole story such a genuine feel that it's very hard to get bored. I really liked that you get perspectives from both ends of the scope, so to speak (good guys and bad guys). It adds to the tension and helps you to feel like you know at least as much as the intelligence officers trying to sort this all out. I liked the variety of characters and settings, even if sometimes the backstories pulled you out of the current setting a little bit. The writing itself is quite well done with only an occasional little goof that's easily forgivable (or easy to overlook because you're reading so fast). The language fits the genre/style well, not too flowery but quite precise and sharp, tactical. A Game for Assassins was an entertaining tale. This is not a genre I often read, but I do enjoy some spy-based TV programmes and films such as Alias, so when the blog tour invite came through, I decided to give it a try. The plot concept is interesting and the characters well-drawn. And for the most part the story moved at a good pace. As you would expect from an author with experience in the field, this tale came across as believable and nicely detailed. For me the only downsides were: 1) some minor editing issues; 2) the fact some information felt "repeated" since we had it from two different view points, often in consecutive chapters; and 3)the fact the plot (which had moved at a nice fast pace prior) started to slow towards the end as we left Gorilla and joined the CIA investigator instead. On this last point, I feel it would have worked better had this investigation storyline been mixed in more in between Gorilla's (and associated) chapters to keep a more even pace throughout. This is an old fashioned, down & dirty spy thriller. The protagonist is not James Bond, there is no glamour just life in the trenches. Quinn did his research & and writes from experience. Loved this book & will be reading the final 2 in the trilogy. Fabulous read, brilliant in depth characterization, story line keeps racing along. cant wait to finish the next one. Well developed characters in a believable story. I'm looking forward to the next one. The book did a great job introducing the characters. The book flowed well until the end chapter it seemed mixed up and didn't follow that well. There are a lot of Americanism which could be adjusted for the UK and Europeans who read this. But I still will read the next book for characters I've met in the book. He is trained in hand to hand combat and in the use of a variety of weaponry including small edged weapons, Japanese Swords and Hunting Bows. He is also a crack pistol shot for CQB (Close Quarter Battle) and many of his experiences he has incorporated into his works of fiction. He lives in the United Kingdom and travels extensively around the globe.